Today , Nigeria celebrates its 57th Independence day. Culture is a way of life and Nigerian children are the future. This edition showcases kids from various ethnic groups whose style defines unity in diversity through indigenous cultural attires as they celebrate Nigeria at 57! Cultural Day happens every year to mark Nigeria’s Independence Day It’s that time of the year when kids dress up in their native attire to their various schools to mark Nigeria’s Independence Day. To celebrate their culture, some celebrities’ kids dressed up in their native attires and their parents shared the photos on social media. To celebrate the occasion, kids have been asked to come to school all dressed up in their traditional attires. Some Nigerian celebrities’ whose children stepped out dressed in traditional outfits took to their respective social media accounts to share photos. 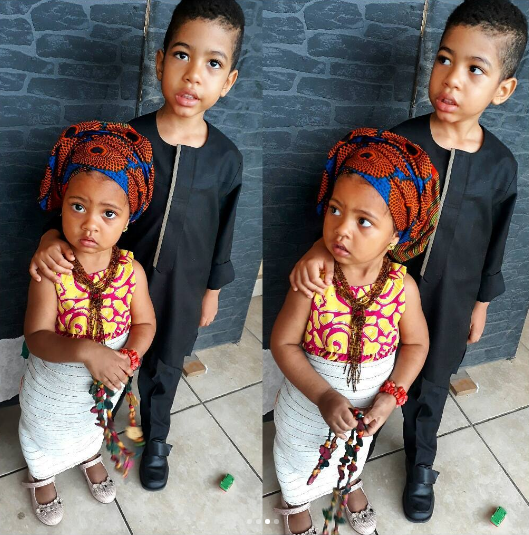 The children of ace comedian, Basket Mouth, that of Peter and Paul Okoye and Lola Maja today at their various schools stepped out in traditional outfits to celebrate their cultural day. They all look glam and colourful in their outfits despite they are young.